Home BOLLYWOOD Hrithik Roshan – Kangana Ranaut Controversy: Rangoli Chandel Criticizes The Actor’s Supporters! Hrithik Roshan – Kangana Ranaut Controversy: Rangoli Chandel Criticizes The Actor’s Supporters! 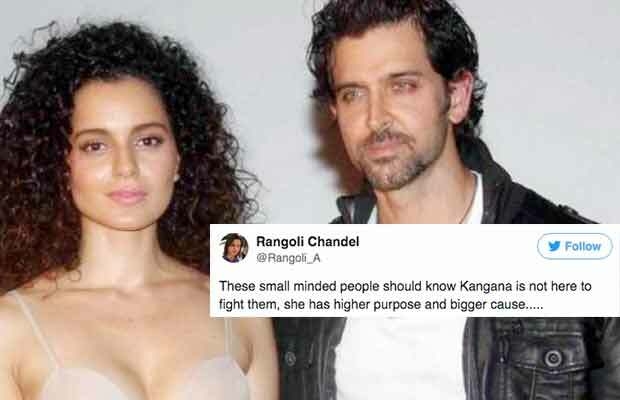 In a series of tweets, Kangana Ranaut’s sister Rangoli Chandel has criticized those who have supported Hrithik Roshan. Hrithik Roshan – Kangana Ranaut controversy has received another input as the actress’ sister has once again lashed out at people. In a series of tweets, Rangoli Chandel has criticized all those who have come out supporting Hrithik. These small minded people should know Kangana is not here to fight them, she has higher purpose and bigger cause…..
…..when they laugh at her, gang up on her and humiliate her the joke is on them. Kangana spoke about sexual harassment, physical violence against her, exploitation at work place and industry has ganged up on her. …even when she did AIB video against sexism, wrote an open letter on Nepotism not a single man or woman from the industry retweeted it. When she fought for pay disparity, many women from the industry attacked her by saying that women can't ask for equal pay. After a long period of time, Hrithik had finally broken his silence over the matter releasing an official statement. He even went to a TV channel for a video interview as he felt it necessary to put forth his side of the story. Since, then the actor has been receiving support from the industry. Stars like Farhan Akhtar, Yami Gautam and Rohit Roy had extended their support for the actor. Rangoli had not spared even them. She had earlier also criticized everyone, especially Farhan, for being biased for Hrithik. And now she has done it again. On the other hand, Hrithik does not want to speak more on the matter. Next article‘Qarib Qarib Singlle’ Trailer One Of The Most Loved Trailers!